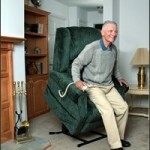 Lift chairs are a special type of recliner that makes it easy to stand and sit. The base of the chair rises into the air and allows the occupant to easily stand without assistance. They are also used to allow an individual to sit in a safe and controlled manner. Will Medicaid Cover My Lift Chair? Most types of durable medical equipment, like lift chairs, adjustable beds, and wheelchairs, are covered by Medicaid, but the amount of coverage will be slightly different in each state. It is a good idea to Contact Your Local Medicaid Office, since the requirements and procedures can vary state by state. Medicaid is a service that is partially funded by the federal government, but each state independently administers and runs the program. The way that each state runs their Medicaid program varies, but they must meet several federal guidelines in order to receive payment. Many people who are on Medicaid are also on Medicare. Medicare, since it is administered by the federal government, it is much more uniform and straight forward about their coverage of Medicare lift chairs and other durable medical equipment.